New teams met before the national competition for a final review of Operations Challenge equipment and procedures. The session was particularly helpful for Acueducto de Bogota, a new team from ACODAL (Colombia), because similar competitions in other countries often use different materials and require different approaches, said Acueducto de Bogota competitor Luis Carlos Herrera. Photo courtesy of Michael Spring. At this year’s Water Environment Federation (WEF; Alexandria, Va.) Technical Exhibition and Conference (WEFTEC®), 44 teams of elite wastewater operators met in New Orleans to participate in the 31st-annual Operations Challenge competition. For 11 of those teams, 2018 marked their national-level debut. To help new teams acclimate to the rigorous pace and complexity of Operations Challenge, WEF held an orientation session this year for the first time in the event’s history. 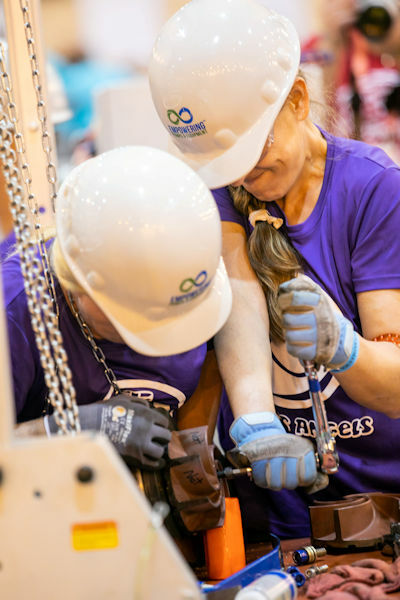 New teams gathered in the New Orleans Morial Convention Center a day before the competition began and spent up to an hour focusing on each of the five Operations Challenge events. The session is one way the exhibition is evolving to help “make sure the competition is accessible to all teams” as it grows, said Steve Harrison, WEF senior manager of operator programs. Operations Challenge 2018 marked the national-level debut of 11 new teams including the first all-female team, Charlie’s Angels. Photo courtesy of Kieffer Photography. Operations Challenge teams often are assembled by supervisors at water resource recovery facilities or leaders of WEF Member Associations who are interested in outside-the-box strategies to help their operators flourish in their careers. Charlie’s Angels, representing the Water Environment Association of South Carolina, formed after the City of Columbia (S.C.) Metro Wastewater Treatment superintendent David Wiman pitched the idea in 2016, said Sarah Hickman, coach of the Charlie’s Angels team. This year, it became the first all-female team to participate in the national competition after performing well enough at the South Carolina Operations Challenge event to earn an invitation. 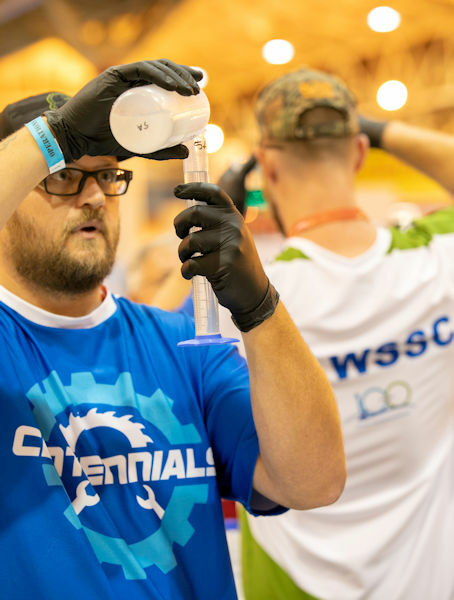 New Operations Challenge teams such as the Chesapeake Water Environment Association Centennials came from around the U.S., Canada, and South America to compete in New Orleans. Photo courtesy of Kieffer Photography. Other teams, such as the Chesapeake Water Environment Association (CWEA) Centennials, form from the ground up. Centennials coach Bradley Yeakle had competed on other CWEA teams with past employers. When he began a new job at Washington Suburban Sanitary Commission (Laurel, Md.) in 2017, his supervisors jumped at the idea of supporting a team after Yeakle outlined how the experience taught him new skills that made him a better operator. After more than three decades of Operations Challenge events, new teams are emerging that follow in the footsteps of past competitors. William Rente, a member of the Florida Water Environment Association (FWEA), competed for several years on the association’s team, Orange Crush. 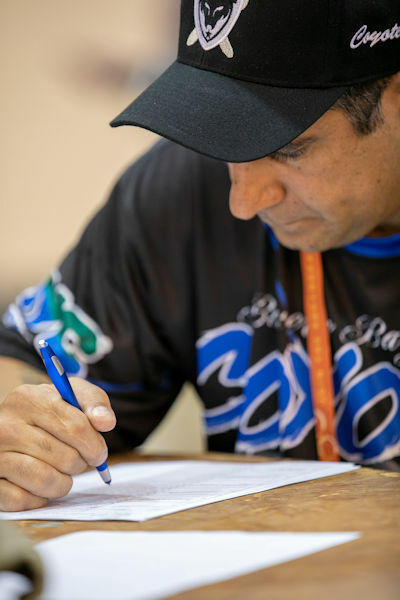 In 2018, he returned to the national competition as coach of a new FWEA team, the Treatment Outlaws. Among the new teams debuting at the 31st national Operations Challenge competition was the Bowery Bay Coyotes, representing the New York Water Environment Association. Photo courtesy of Kieffer Photography. Kevin McCormick of the New York Water Environment Association (NYWEA) shares a similar story to Rente’s; after competing on NYWEA teams from 1998 through 2004, he returned this year to coach NYWEA’s Bowery Bay Coyotes. “This is a legacy that guys like Kevin started and we’re carrying on,” said Gene Buckley, member of the Bowery Bay Coyotes. Once potential teams recruit members and secure support from their supervisors, next comes the hard part: preparing for the competition. This involves countless hours of practice over several months, studying rules and procedures for each event, finding time when all members are free to gather, and learning to work as a team. Practicing becomes even more daunting without specialized Operations Challenge equipment, such as gantries, simulated manhole rigs, and laboratory chemicals, which most new teams do not have on hand. Many of the new teams, such as Can’t Flush This from the British Columbia Water and Waste Association, had to make substitutes for specialized equipment during practices or enlist the help of veteran teams to prepare for the national Operations Challenge competition. Photo courtesy of Kieffer Photography. To make up for unavailable equipment, many new teams took advantage of the cooperative nature of the water sector and put their ingenuity into action. Can’t Flush This, a new team from the British Columbia Water and Waste Association, lacked much of the specialized equipment used in Operations Challenge at their home facility, said coach and captain Dan Deacon. It worked with available items, substituting similar-shaped household objects for missing equipment during practices. “We practiced the Safety Event on the floor,” Deacon said. Insane in the Force Main called in a favor from Dirty Deeds, a fellow Ohio Water Environment Association (OWEA) team, to practice on their gantry setup for the Safety Event. The team spent days practicing alongside the veteran OWEA competitors, said Pat Hoffert, Insane in the Force Main competitor. “If we weren’t able to go up to their facility and use the safety stage, we would have never seen the Safety Event other than from the hours of YouTube videos we studied,” Hoffert said. “As soon as some of the more competitive teams see that we’re a new team, they offer pointers all the time,” added teammate Eric Janus. Coaches for this year’s new teams explain that the experience of practicing and competing alongside one another during Operations Challenge builds stronger operators and wider professional networks. Robert Burgess, coach of the Water Environment Association of Texas (WEAT) Pooseidons, said he appreciates that the competition exposes his team to new skills they are not likely to learn at home, since none of the Pooseidons work at a water resource recovery facility. Despite never appearing in a national-level Operations Challenge competition and coming from an organization without a water resource recovery facility, the North Richland Hills (Texas) Pooseidons, representing the Water Environment Association of Texas, won first place overall in Division 2. Photo courtesy of Kieffer Photography. By learning to work together in a fast-paced, high-stakes environment, competitors also forge close bonds that provide benefits back at the job site. 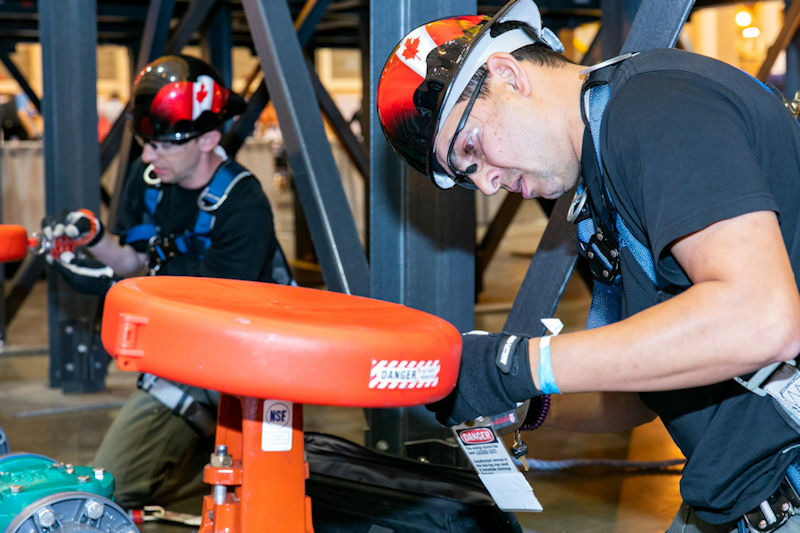 Repeatedly running through events during practice in search of the best time taught AySA 4KV, a new team representing Argentina, “the best way to work as a team and communicate,” said competitor Nicolás Couso. Between teams, the benefits of friendly competition last far after the announcement of final scores. McCormick returned to Operations Challenge to coach the Coyotes because “people who compete stay in touch,” compare notes, and share knowledge, offering an invaluable mentorship opportunity for younger operators, he said. Nearly a year after joining together and preparing for the competition, all of the new Operations Challenge teams say they came out on the other side as stronger operators, managers, and professionals. “I have a better understanding of what the competition prepares you for from the wastewater treatment industry and that’s something we take back,” Burgess said. 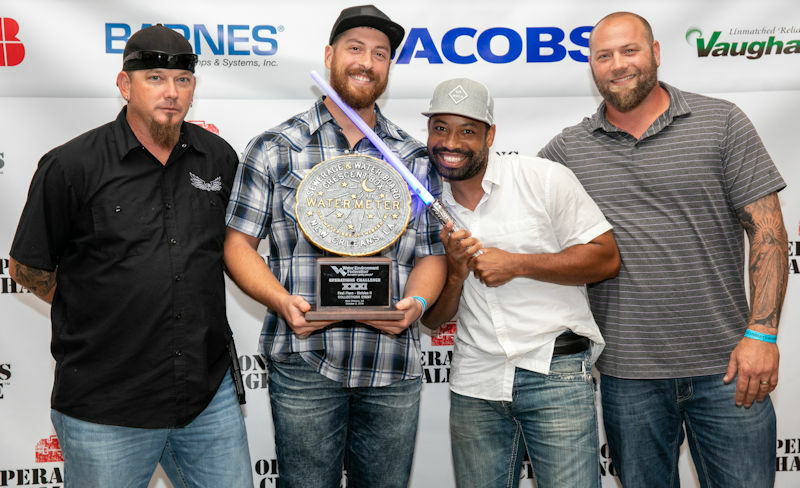 New skills weren’t the only thing the Pooseidons took home from New Orleans — the team won first-place overall in Division 2 during their national competition debut, proving that in Operations Challenge, skill and determination pave the road to victory. Every year, Operations Challenge attracts additional teams, furthers its reach, and results in remarkable stories from volunteers and competitors. Read coverage of the event in the December 2018 issue of WE&T. Search for #OpsChallenge on social media to listen to the 12 Days of Operations Challenge song. And check the Operations Challenge 2018 website to find more capturing stories. ← From the President: Why Do You Do What You Do?